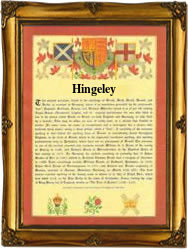 Recorded in several forms including Engley, Hingley, Hingeley, Ingley, and Insley, this is a surname which is almost certainly English. However spelt it is locational, and probably originates from Hensley or Hensleigh, a lost village in the county of Devonshire. Some three thousand British surnames are proven to be from lost villages, of which it is estimated that at least five thousand have disappeared from all maps and gazetters over the past five centuries. The reasons have been described in several books, but these are usually changes in agricultural practices, land drainage, war, plague, and more recently suburbanisation. In the case of this surname, the original place name is believed to derive from the Olde English word 'henna' meaning a hen or fowl, and '-eg,' meaning an island. Early examples of surname recordings taken from surviving church registers includeThomas Hensley of North Molton, on August 16th 1557, Nicholai Ingly, at Ashburton, on March 12th 1624, John Engley, who was christened at the same place, on March 27th 1732, and in the city of London Thomas Hingeley who was a christening witness at St Lukes Finsbury on March 12th 1769. Throughout the centuries, surnames in every country have continued to "develop" often leading to astonishing variants of the original spelling.